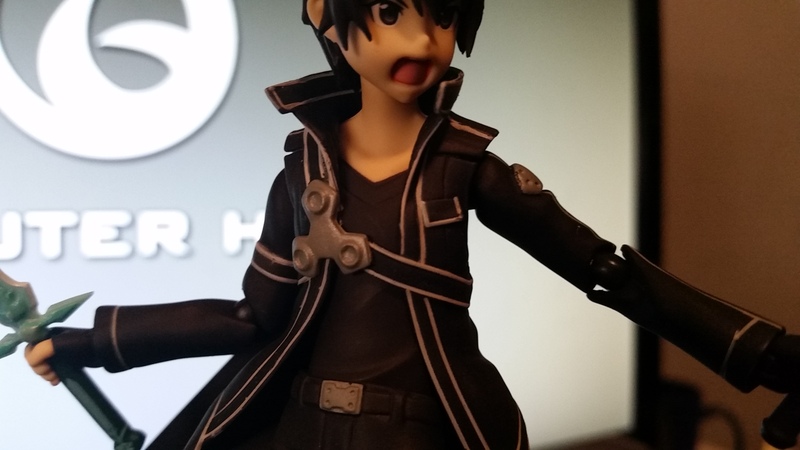 I have managed to get my hands on Kirito Figma Action figure from Max Factory. 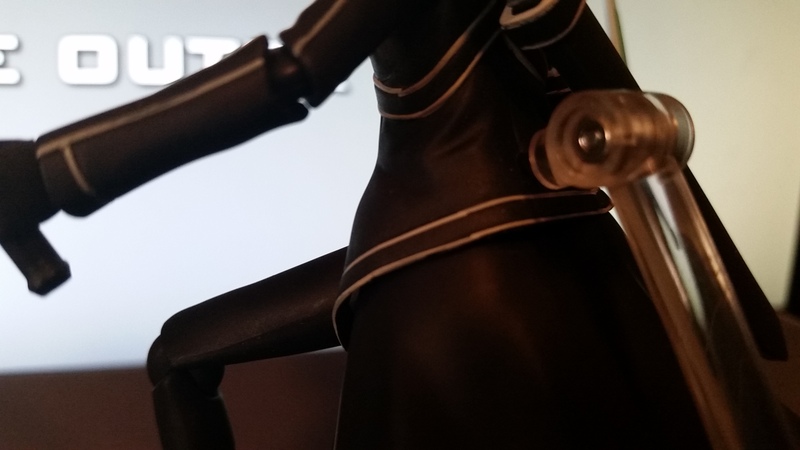 This was the first time I have owned a Figma, but what I have heard about their quality and detail was no lie. Overall, I was highly impressed with the figure, but it’s not enough for me to just say that. Let’s take an in-depth review at Kirigaya Kazuto aka Kirito from Sword Art Online! First a look at around the box. It’s a pretty standard Figma box in awesome Sword Art Online colors. There is an image on every side so you can see what it is no matter which way you stack it. On the back, we get a good idea of what’s in the box: accessories, extra faces, and examples of poses that we can hope to achieve. As with most Figma boxes, there is a removable backdrop that can be attached to a stage which is sold separately. 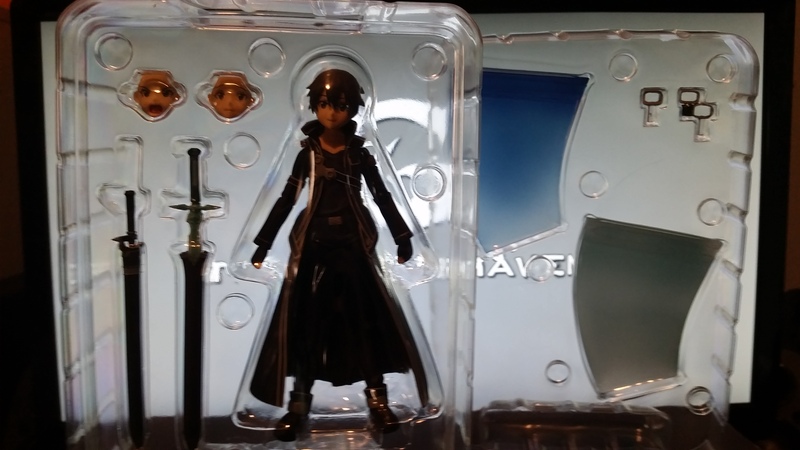 The contents have the figure itself, two extra faces (in addition to the default face), Kirito’s two swords and their scabbards, and in the back, the awesome effect accessories that you can attach to his swords. On the bottom, you get the base and the instructions. An awesome figure from Max Factory that meets my expectations of the quality I’ve heard about from them. The head looks really nice. The sculpture to the hair is great and the facial features are very sharp and detailed. 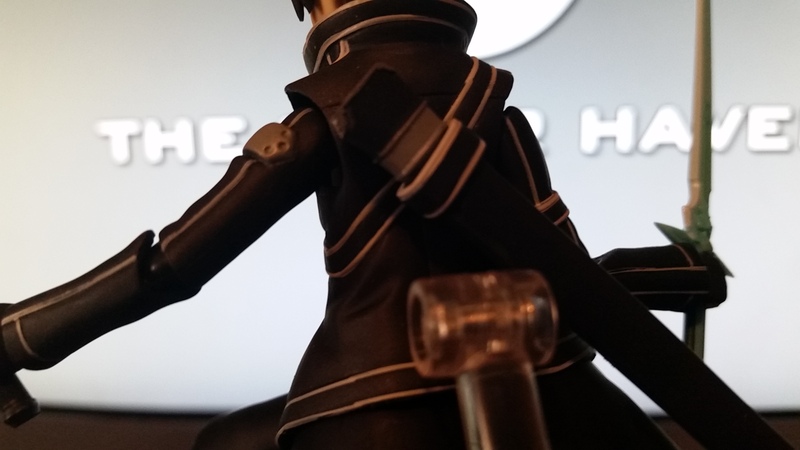 Kirito is a rather simple character design, but the people at Max Factory were able to make this figure look awesome regardless. It was their innate attention to detail and their ability to produce some of the best figures in this scale range that contributed to the overall amazing look of the figure. They’ve also managed to blend the joints in quite well on this figure. I’m especially impressed by those found here on the jacket, which can barely be seen at all and it always looks great no matter what the angle or how you bend it. We have Kirito’s sword Dark Repulser. The color’s nice and the details look great. It also comes with his other sword, the Elucidator, which doesn’t stand out as much as the Dark Repulser, but a great looking sword nonetheless. We also get a scabbard for both the Dark Repulser and the Elucidator. 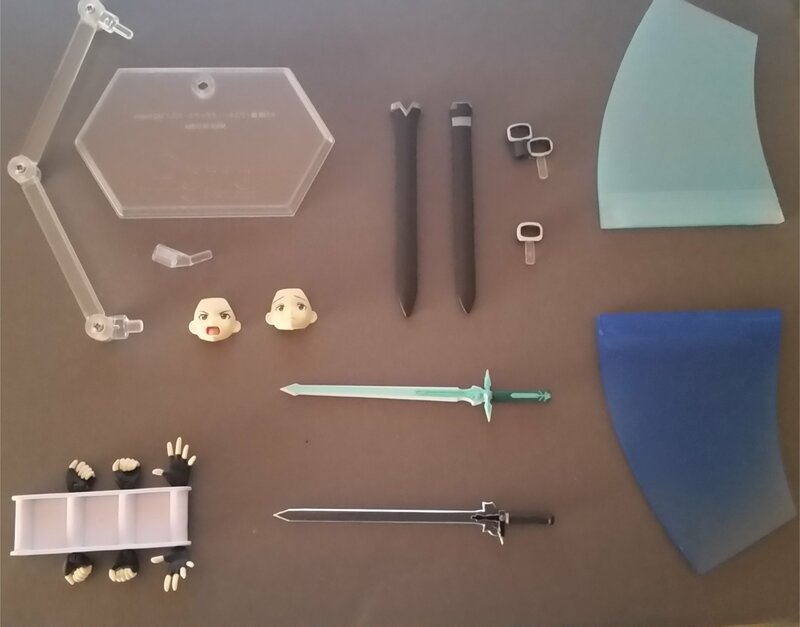 Also included are the parts for attaching the scabbards to Kirito’s back. By far, the biggest, and heaviest, accessories that come with this are the slashing effect parts which slip onto Kirito’s swords. Light blue for the Dark Repulser, and Dark blue for the Elucidator. Both scabbards are fully functional and the swords can be inserted and removed quite easily. There is a little issue with the scabbards, however. The swords do show some wear right out of the box and this might worsen with constant use. Also, I am not sure if there was a production error on my end, but the holder for the Dark Repulser scabbard did not fit smoothly at all. The one for the Elucidator fit just fine, but I really had to use some force to try and get it to slide in. The figure comes with three pairs of alternate hands as well as the default pair. Two extended finger, open-palmed hands, two sword-holding hands which hold the swords roughly at 90 degrees from his arms, and another pair of sword-holding hands which hold the swords at a sharper, more extended angle. The sword-holding hand are very tight and while you can bend and pry the fingers to get a looser fit, the swords didn’t even fit unless you went that route. In the face department, we have two additional faces. The default face is a smiling, pleasant expression. Face number two is a sad or apologetic face, and the third is an open-mouthed angry face with some nice minor detail on the upper teeth. Changing the face is a piece of cake.. just remove the front of the hair, pop off the face, and insert the one you wish to use, then put the front of the hair back. Swapping out the hands is even easier than the face… just pop the hands out and insert the new ones. Lastly.. there are the slash effect parts which slide easily onto the swords. These parts are heavy and there is concern about the swords breaking over time. Right where the handle is joined to the rest of the sword looks quite weak and it’s the same on both swords so make sure to take care when handling them. In fact, when I was trying to place the Dark Repulser into one of Kirito’s hands, that very part of the sword which connects the handle to the blade actually started to move and become loose as if it were ready to break and I hardly applied any pressure at all to it. So take extra care if you plan on doing any posing or action shots with that sword. Side to side movement of the head is great.. forward movement is also great, but bending the head backwards does have its limitations. You don’t exactly get a full tilt back and that can be annoying if you’re trying out certain poses. You can move the arms up and down and it has a 360 degree rotation. At the elbow joint, it can bend up to about 45 degrees. There is full bending of the hand as well in both up and down motions, giving it a lot of flexibility. There is some limited movement at the waist, however. Kirito cannot even bend over fully, but it does have some nice side to side tilt movement. Despite these limitations, I was still able to achieve some pretty good poses so I supposed it’s not completely necessary, but it is a minor annoyance nevertheless. Leg movements can bend up fully, back, slightly, and slightly out to the side to about a 35 degree angle. The bend of the knee is similar to the arm.. about 45 degrees again. There is an impressive amount of upwards and downwards movement at the foot as well. 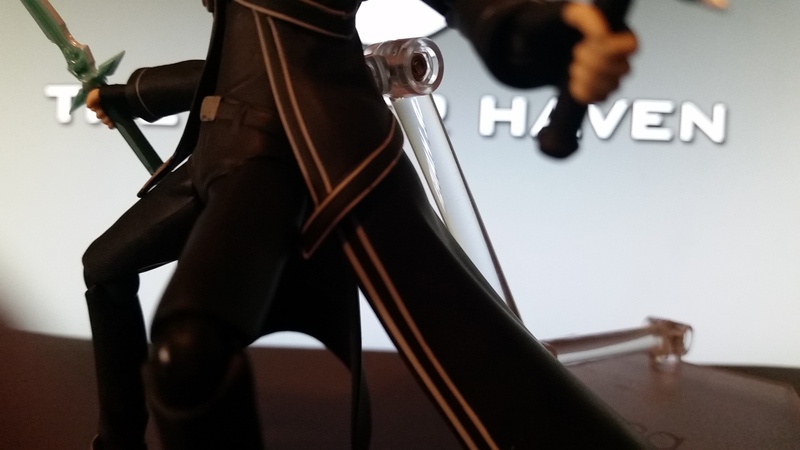 The back of Kirito’s coattails also swing outwards and to the sides, making for some awesome looking poses! This figure is of amazing quality, but there are some sections where the paint is a bit messy. There are some mold lines here and there, especially on the front of the boots. The wrists and the arms are also not strong enough to support the heavy effect parts at times and makes some poses impossible when they are attached. Max Factory really knows how to make a figure and while some of the issues I listed above will vary from figure to figure, I was satisfied with the overall quality. The swords should have been a little bit stronger as I now fear that any more tampering with the Dark Repulser may cause it to break. If you are a fan of Sword Art Online, this is a figure you will want to have in your collection. I highly recommend picking this one up!